The Colts became defunct after the 1950 season, and YA Tittle joined the San Francisco 49ers. He played there for ten seasons, through 1960, often struggling for playing time. 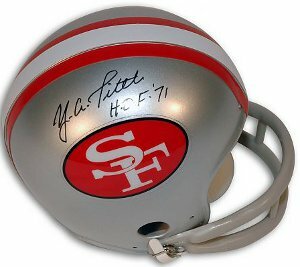 YA Tittle has hand signed this San Francisco 49ers Throwback 2 bar Mini Helmet with HOF 71 inscription. James Spence Hologram and Certificate of Authenticity from Athlon Sports.